Gratitude Health Inc. (OTCQB: GRTD) is a unique beverage manufacturer with a focus on creating healthy, ready-to-drink beverage products. What makes the brand stand out in the functional beverage space is this unique mandate to deliver refreshing, nutritional products with measurable health benefits. Warren’s background strongly complements Gratitude’s position as an innovative public beverage company. In addition to working as a broker for nearly two decades, Warren has 22 years of experience in the functional beverage space. While working with The Coca-Cola Enterprises (CCE) to distribute his Bravo Brand of drinks back in 2007, Warren saw that consumers were no longer satisfied with drinks that did little more than provide high concentrations of sugar. He noticed a major shift in the beverage market – triggered by the sudden emergence of energy drinks – as consumers began to favor functional beverages over sugary, flavored ones. Today, Warren wants to serve this continued, rapidly growing demographic of consumers that are now looking more for functional, health-boosting drinks. He believes a number of products on the market today try to serve that demand, but that none are up to the level of quality that he and his partner provide with Gratitude. Gratitude COO, Andy Schamisso, is a veteran in the health beverage industry. In 2002, he launched an iced tea company called Inko’s Tea, which offered what was the first, ready to drink, “white tea.” Inko’s hallmark was high quality, all-natural ingredients that provided all the health benefits for which teas are known. After selling Inko’s in 2014, Schamisso started working with Warren, and it wasn’t long before they started building Gratitude. With a combined 37 years of experience in the beverage market, Warren and Schamisso are set to make some serious waves in the beverage industry. True health beverages are rare in today’s beverage market – but Gratitude is ready to change that. 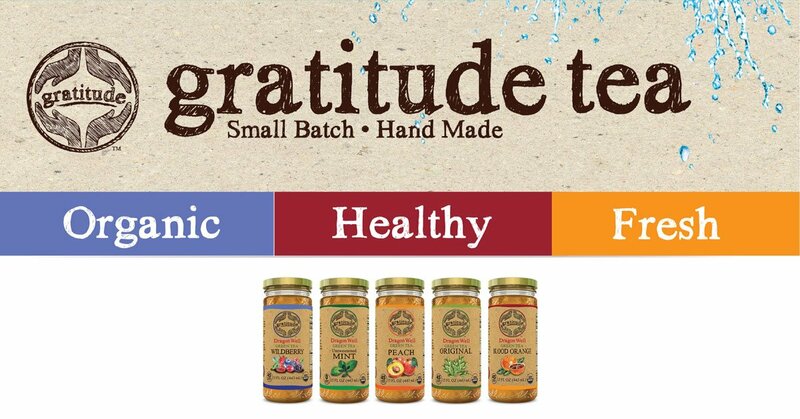 Gratitude’s beverages incorporate superfoods, including many potent antioxidants that teas are known to contain. Each bottle of Gratitude tea contains 417 mgs of polyphenols, a form of micronutrient with powerful antioxidant properties. Polyphenols have been found to reduce the risk of cancer, diabetes, and more. The Gratitude team has tested its teas against similar beverage products currently on the market and has found that Gratitude has the highest levels of antioxidants. So, when Warren and Schamisso say Gratitude is good for you, they aren’t kidding! All of Gratitude’s teas are USDA-certified organic. That means each ingredient is grown and produced using green and responsible methods and means. In other words, everything from the quality of the soil the plants are grown in to the brewing process is certified as being free of artificial affects. Florida-based Gratitude was founded in 2018. Though the company is young, Warren and Schamisso have done their homework to ensure rapid growth. They believe sugar-laden beverages are on the decline, and that today’s consumer wants refreshing drinks that hydrate while offering real health benefits; that’s where Gratitude stands out. At present, Gratitude teas are on shelves in over 150 locations in New York City – and the company is just getting started. Keto Refuel is designed to help users maintain and promote their bodies ketogenic state and stay there longer with fewer carb cravings. This innovative product is the first shelf stable “meal replacement” beverage of its kind and comes in unique eco-friendly packaging. The functional drinks market is forecast to reach nearly $94 billion in 2019, according to Grand View Research. As health-conscious consumers pull-away from sugary drinks and fuel this industry growth, Gratitude has the leadership and vision to meet increased demand for innovative products that promote health and wellness. PrevPreviousRoy Warren Sr. CEO and Andy Schamisso, President and COO of Gratitude Health, Inc. are Featured in an Exclusive New Audio Interview at SmallCapVoice.com, Inc.